In year 2012, we saw a deluge of online courses offered by Ed Tech companies like Coursera, Udacity and edX. 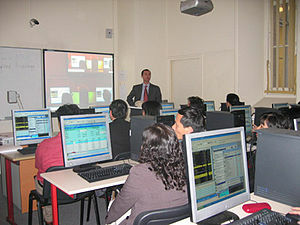 The number of students enrolled in these courses is a proof how online education is in great demand across the world. However, of the millions of students who enroll for online courses, only a small percentage of students actually complete the course. Coursera founder, in an interview last year said that courses at Coursera have retention rates of 7% to 9% depending on the course. The retention rates are of similar order or lower with other MOOC providers. Very soon, we would see solutions coming out to solve this problem and hopefully see improvement in retention rates. Some attempts would be in form of providing more structured education around MOOCs, especially in countries like India. We would also see some startups focussing on bringing the web product principles and improving the engagement of courses offered by employing personalization, gamification techniques etc. Content plays a key role in education but the methods currently used in online education are still old and somewhat linear. Going forward, we will see a lot of innovation happening in how education content is presented to students and how it can be made more engaging. One good example from year 2012 is Edmodo, that is bringing social aspects in the way content is consumed with more than 19 million students and teachers on board. We might also see startups coming up with technologies to bring more interactions in video lectures and other rich media. The core learning experience would depend largely on the way education content is delivered and consumed online. The learning experience over mobile is still in infancy and in future, we will see a lot of attempts in improving the same. With the changing perception about mobile usage for certain activities, education would be a key contender and we would see Ed Tech companies working on mobile experience. Other than these, I also think we will increasingly see more “teacher” involvement in EdTech instead of just bunch of techies solving education problems.